How the vision of creating the most advanced and visual exciting New Year countdown on the planet became reality. New Year’s Eve is the night that every metropolis stages its own impressive celebrations. 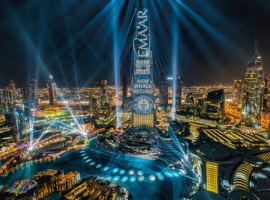 Emaar, the Dubai-based global property developer, had the vision to top everything before and create the most advanced and visual exciting New Year count down on planet. 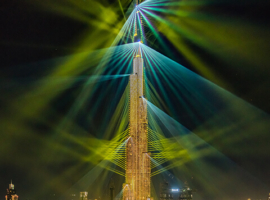 The idea was to deliver ‘the biggest show in the world in Downtown Dubai and its center Burj Khalifa and make a positive, lasting impression, not only on the people celebrating in Downtown Dubai, but on the whole world. 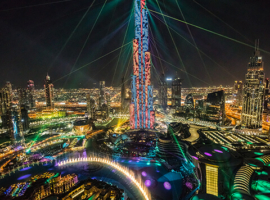 Light Up 2018 conquered a massive creative and technical task: Implementing a spectacular multimedia show at the 828-metre-tall Burj Khalifa was huge challenge. The whole team was pushed to the limit. Although five months for the execution were given, the onsite team could only install the hardware during the final two months, often in very tough and restrictive conditions. Once the installation was done, perfectly the creative team would have run the show in its entirety many times over. However, the content and its nature had to be kept secret until New Year’s Eve. 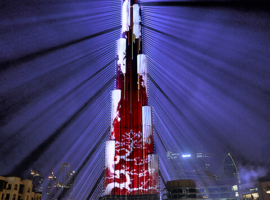 This was never going to be easy when the canvas is visible from across whole Dubai! 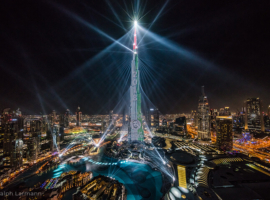 Light Up 2018 inspired a global audience and broke the Guinness World Record as ‚the largest lighting and sound show on a single building‘. The show attracted over one million visitors from all over the world, as well as reaching more than 2.5 billion viewers through live TV broadcasts and social media live streams. So huge was the show’s impact that the installation was extended for the celebrations of the Chinese New Year. AO Creative delivered a brand new narrative and video, sound and light content for the night, following which the original production extended its run until 31 March 2018.  AO Creative was responsible for the project development, the design and implementation of the content and the pre-production, as well as the show and lighting design. The team was also in charge for the delivery and installation of the requisite material as well as the provision of control and communications equipment. 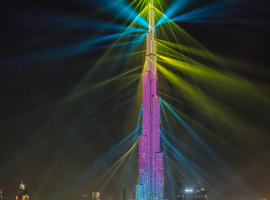 In all, 550 moving lights and specially modified outdoor lasers were used in total, many of them having to be dismantled to fit in the lifts and then rebuilt in their rigging location. 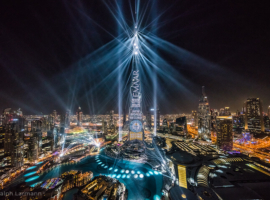 It took 280 moving lights rigged around to frame the entire building, along with 109,252 square meters LED screen and special outdoor beam lights rigged on the façade edges to deliver the highest searchlight and lasers even on top the pinnacle of the Burj Khalifa. 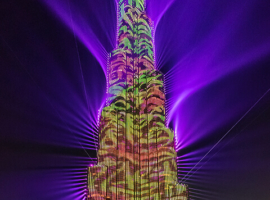 An atmospheric fusion of fountains, light, sound and video was the result. Inspirational content included Arabic calligraphy, geometric designs and the story of Sheikh Zayed bin Sultan Al Nahyan, the UAE’s first president. 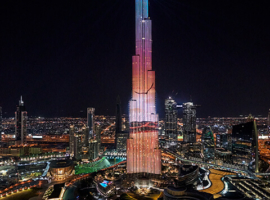 The LED façade of the tower acted as the central storytelling element, while sharp beams of light framed the building’s distinctive shape. 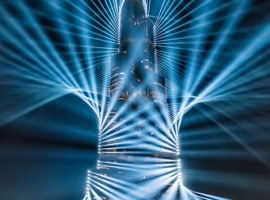 The immersive installation visually remodelled the 828-metre-tall Burj Khalifa tower and its surrounding area, enabling audiences to see Dubai from a whole new perspective. 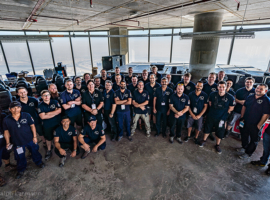 An international team of over 300 specialists was present on site, including 100 specialists in wire-supported working techniques and industrial climbers. AO Creative’s team clocked up in all over a million kilometers of travelling in the course of the ‚Light Up 2018‘ mega project. 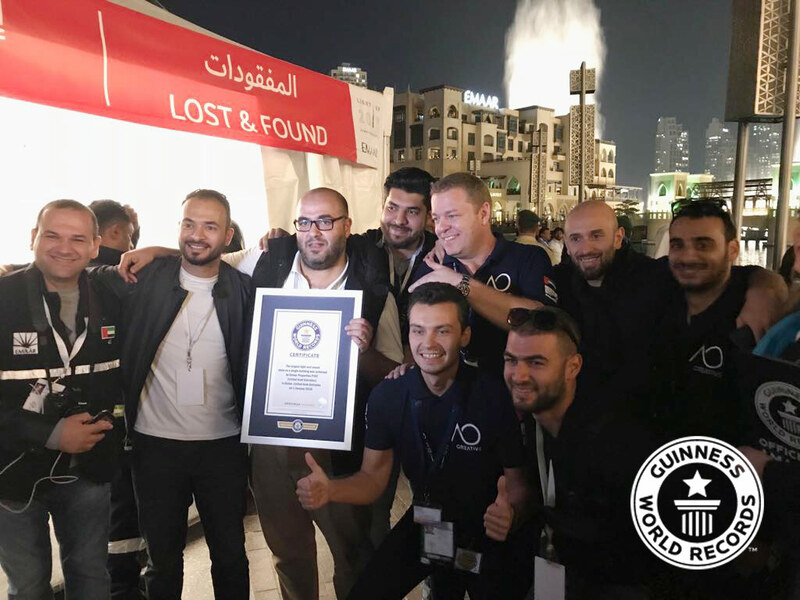 In order to break the Guinness World Record they used 118.44 tons of equipment, 28.7 km of cable and 76.3 million lumens of light.